Hcalc is a simple hydraulic calculator which we originally developed for use with our FHC training courses to help teach some of the fundamental hydraulic calculations & principles which are so important in fire sprinkler design. We believe that all fire protection engineers should have a good understanding of the principles of hydraulic calculations to enable them to optimize designs and to ensure that all calculations can be properly checked and verified. Fire sprinkler engineers, inspectors, and insurance companies will find a use for our free Hcalc - Hydraulic Calculator. It can be used for teaching the principals of hydraulics in fire protection engineering, checking calculations or for solving simple hydraulic calculations for fire sprinkler, hydrant, hose reel and other types of water-based fire protection systems. give it a try today for free! Fire protection engineers and consulting engineers from around the world have installed Hcalc to help them with calculations and the verification. 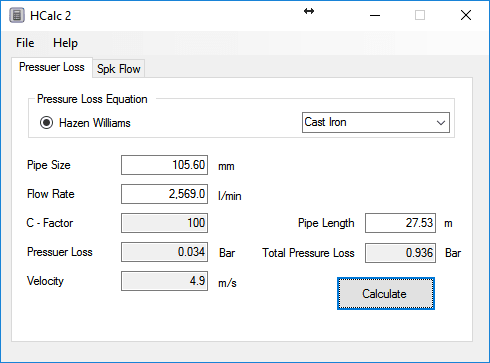 With Hcalc you can calculate the friction loss in a circular pipe using the Hayes and Williams pressure loss formula which is specified in NFPA 13 and EN 12845 and in many other international design standards. You can specify the pipe size, flow rate, and the pipes C-factor and Hcalc will calculate the pressure loss per meter and for the total pipe length and the water velocity. You can select the type of pipe material from the drop-down list or enter your own pipe C-factor. Whenever you need to carry out pressure loss calculation or to verify the simple calculator is ready to help. 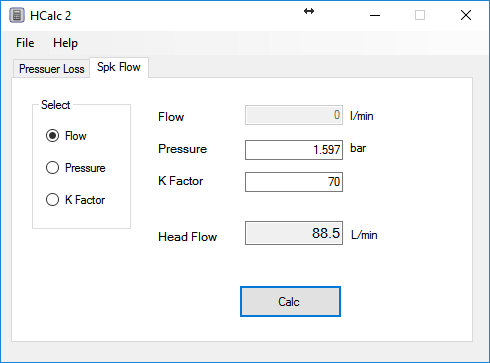 With Hcalc - Spk Flow you can solve any of the three variables in the K-Factor formula, the flow from the sprinkler, the pressure required at a sprinkler and the K-Factor without the need of remembering the formula. The K-factor formula is one of the basic building blocks of fire sprinkler design and fire protection hydraulic calculations, most of us will have committed it to memory but now with Hcalc you know longer need to. You can have this simple tool sitting on your desktop so you no longer need to find your calculator or pen and paper. You can use Hcalc any type of fire sprinkler or water mist nozzle or in fact any other nozzle or head which you have a K-Factor, this could be a hose reel nozzle, a foam monitor or a fire hydrant. If you have an interest in hydraulic calculations and the formulas associated with then then we have an excellent series of articles which will enhance your skills as a fire protection engineer. Hcalc is easy to use but will have still provided an on-line user manual and a short video tutorial to help get you started. You will also find all the formulas which have been used clearly set out and with additional information. If you're interested in learning more about hydraulic calculations for fire sprinkler systems would like to know how to carry out calculations for a simple tree (end fed) systems using the time honoured longhand method with paper and pen, then you may find our article how to calculate a fire sprinkler system to be of interest. We personally would not recommend this method anything more than a very simple system as by its nature will very likely to make an error somewhere in the calculation which is then compounded as you move along. Our FHC hydraulic calculation software is ideal for carrying out some calculations from the simplest to the most complicated system design.